Rasch-homogenous test for pilot selection. Main areas of application: flight psychology (also for problems connected to space flight). At the center of the test requirements are two ability components: first, the ability to move visualized pictures around one or more of the three spatial axes (mental rotation) and second, the ability to change the perceptive system from egocentric to allocentric. Rasch-homogenizing of the item pool should help to exclude the use of abilities other than the required solution techniques and thus the application of other abilities. The task is to say, based on a diagram of an airplane, what changes in position (rotation around 3 axes) must have taken place between two consecutive position displays. 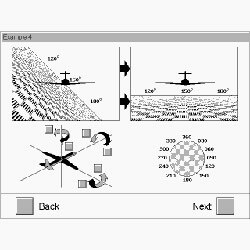 The positions are displayed by means of picture pairs with information on the position of the plane, such as result either during a visual flight or an instrumental flight. There is one standard test form available with 13 items. The internal consistency (Cronbach's Alpha) is r=.74. Validity with respect to the external criterion (orientation, established on an instrument flight simulator) is rtc=.56, with respect to the internal criterion (Eliot Price Spatial Test) rtc=.64. Norms from an evaluation calibration sample comprised of 596 persons for the age groups 17 to 38 are available.